A pack of four robust, easy-to-use corner brackets for making your own raised beds, with no more size restrictions. Can be stacked up to 5 levels high. 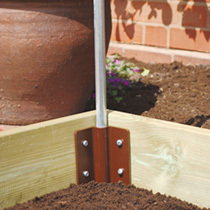 Suitable for use with any wood up to 15cm (6") wide (not supplied). Made from strong durable plastic, they will last for years. Full fitting instructions enclosed.